SEM was once used as an umbrella term for anything to do with online search marketing and encompassed things like SEO. But marketers have since made the distinction between SEO and SEM. SEM now most commonly refers to paid advertising within search engines. Most importantly, we want you to fully understand why so you can explain that to your clients and sell some paid search advertising like a pro! And trust us, there are a ton of reasons why your clients need SEM – 15 to be exact! The number one reason that any marketing agency should be pitching SEM to their clients is more money! Marketing’s raison d’etre, the reason businesses be in business, is to show me the money! While Bing, Baidu, Yandex and all the rest offer profitable playgrounds for search ads to bring in more money, Google has some hard data to prove it. 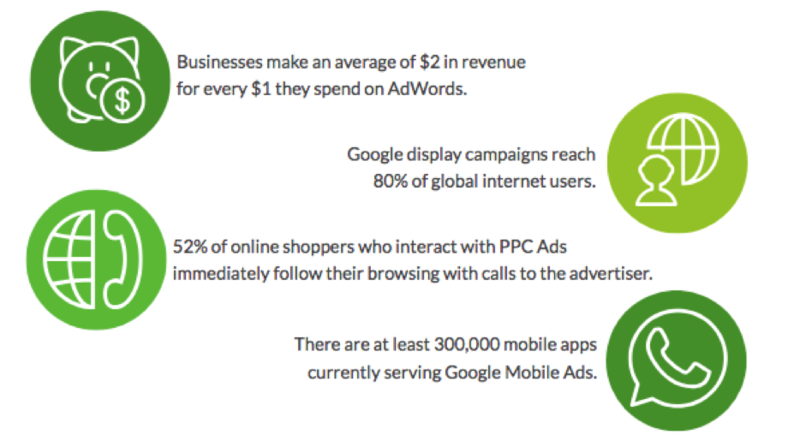 According to Google, any business can double their investment on AdWords! Of course, anyone who has ever run an SEM campaign in AdWords knows that while this is possible, you have to know what you’re doing to achieve these results. At the end of the day, SEM offers brands and agencies the potential to make more money from their marketing campaigns. So while money is typically the main goal of marketing campaigns, other types of conversions shouldn’t be ignored. Marketing campaign objectives like new subscribers, newsletter signups or even contest entries are all alternative types of conversions that a marketer may be trying to achieve. While SEM is often considered a bottom-funnel marketing channel, it can also support brand awareness. 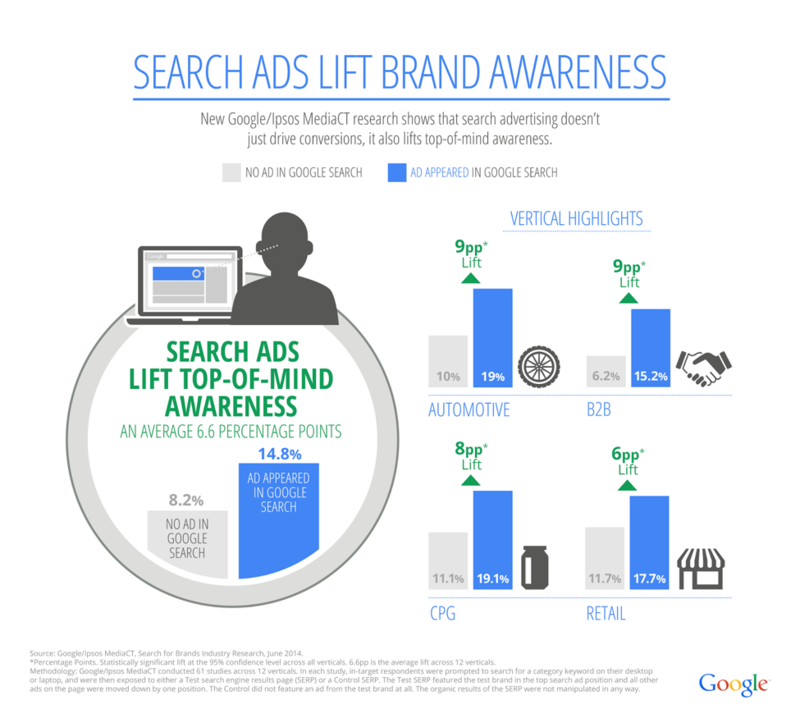 According to Google, search ads can increase brand awareness by 80%. Even if ads don’t receive clicks, brand names are still clearly visible on the top of the fold, and searchers may still read or recognize the product, brand name or URL when they see the ad. Searchers might also take notice when ads include keywords and search terms for competitor brands, as the brain tends to compare things that are listed side by side. One of the biggest hesitations with paid search advertising is cost. Brands and agency clients often think that the costs of SEM will outweigh the benefits; however, as we pointed out from Google’s data in reason #1, if managed correctly you should double your investment in AdWords. So the potential for ROI is there no matter what. Similarly, it doesn’t take much to advertise on search engines. There’s also no minimum amount you have to spend to run ads. As little as $5 will get you started if you’re on a budget. The success that you will get for your budget is a different story though. Acquisio has done a lot of work to bring positive SEM results to even the lowest ad spend budgets. Today SEM is available to even small accounts, which is great news for agencies serving SMBs and multi-location franchises that need to spread their budget amongst many location-based campaigns. SEM is an important tool for driving website visits and getting more conversions on almost any budget – it’s even more important if you’re a local marketer though! Local marketing aims to connect regional businesses with the surrounding community that it services. In other words, when people search online for local business services, like “dry cleaner near me” or “food delivery in Montreal,” it’s local marketers who make those queries connect with business listings and ads in search engines. Local marketers have a leg up in Google when it comes to SEM results! Local SEM ads also give businesses a leg up when it comes to generating actual foot traffic for local stores. Research shows that 75% of searchers who find local business information online will then visit a physical store within 24 hours, hopefully to make that purchase. SEO and other forms of online marketing tend to be “long game” strategies that generate web traffic over a long period of time (6+ months), whereas SEM has the potential to deliver immediate results. Ads typically take minutes to create, and though there is an approval process that all ads must go through before they appear in the SERPs, the average time between creation and ad launch is around one business day. After that you can sit back and watch the clicks roll in! Well that’s not entirely true… ongoing account maintenance and optimization is simply part of running SEM campaigns. The point though is that from the minute your ads are launched, which doesn’t take long, the potential to start getting more clicks and even sales is alive. For this reason alone, SEM is one of the fastest-to-launch traffic strategies out there. Just keep in mind that campaigns should still be optimized for long-term results. Every business wants consistent web traffic to maintain visibility and sales, but also to be able to plan, forecast and budget. Unfortunately, spikes and drops in traffic are often prevalent and at times unexplained. To mitigate some of the chaos, search ads can be used to generate consistent traffic for certain keywords and help you control the amount of traffic coming to your site at any time. One Google study found that “incremental ad clicks make up 89% of traffic generated by search ads but aren’t replaced by organic clicks when ads aren’t running.” In other words, search ads will generate traffic to your site, even when SEO and other marketing tactics fluctuate. Of course, it’s not all about generating traffic. One of the biggest benefits of search ads is the ability to bring in the right traffic. You can’t always control who sees your organic search results, but with SEM, you can create a custom audience that will be far more likely to see and engage with your ads than the average searcher. PPC search ads allow you to target specific demographics as well as visitors at any point in the sales funnel, meaning that the traffic you receive from paid ads is more likely to be qualified than traffic generated from organic SEO. Using negative keywords can also help filter users coming to your site through PPC ads, further improving your odds of converting. 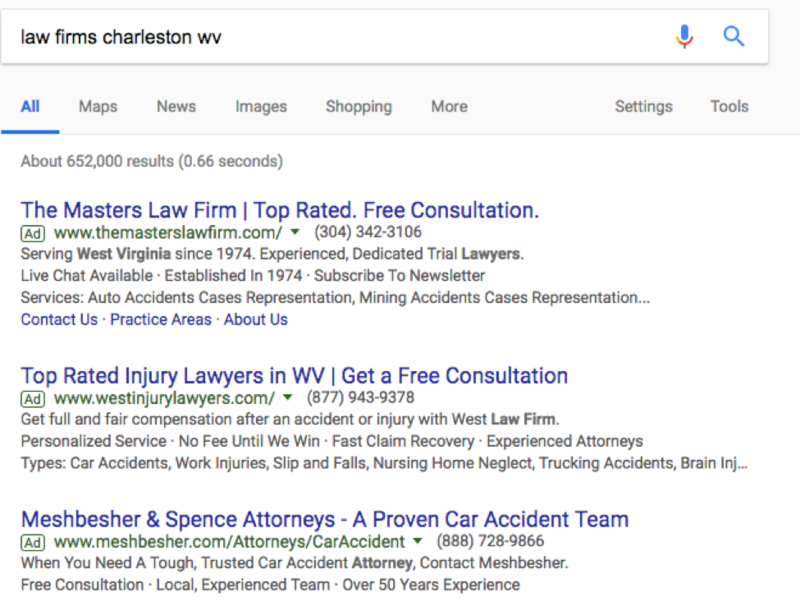 Ads appear first in search engine results. Having a paid search ad gives you a good chance of being at the top of the SERPs (in the ad section of course) if your keyword bid is high enough and your quality score is good. However, there is one rule to getting clicks in search engines and that’s being on or near the first page. Clicks tend to drop off after that and search engine marketing becomes less effective the deeper you are in the results pages. The image below shows CTR declines for every position, and dramatically after the first page to almost zero. So SEM can get you into the first page more easily than SEO would and that’s where all the clicks happen! SEM can deliver instant visibility and as we saw in Reason #9, searchers click near the first position. The main reason for this is a practical one. People just want an answer to their query as fast as they can get it, so search ads get clicked indiscriminately. In one media use survey from Ofcom, 50% of participants could not identify paid ads from organic ads when shown a SERP screenshot. In other mediums people tend to avoid ads, but that’s not the case in search engines because they serve a functional purpose and are often not even recognized as ads! SEM can also be helpful for analyzing traffic and discovering search intent. By analyzing the data from your PPC search campaigns, you can see patterns in search terms, which ads receive the most clicks, and the number of conversions for each ad so you can identify important trends. Understanding keywords (especially long-tail!) offers unique insight about what your customer is looking for that can help inform other marketing channels. Since the era of Not Provided began, discovering search intent through paid search channels and bringing that back into organic has been a frequent strategy. Search intent is also helpful for optimizing your CTAs and landing page copy. In addition to insight about your own customers, SEM can deliver insights into your competitors! By checking your competition’s ads and comparing their targeted keywords to yours, you can increase the effectiveness of your own campaign and, in certain cases, actually rank higher than competitors for the same terms. Competitive analysis tools can help you track keywords and analyze other valuable insights that will improve your marketing campaigns and help drive more traffic. Reason #13: SEM is Actually a Diverse Channel Itself! When it comes to ad options, SEM is not as limited as you might think. Oh and did we mention Google Shopping ads?! These visual search results stunners drive a lot of clicks and conversions for retailers. 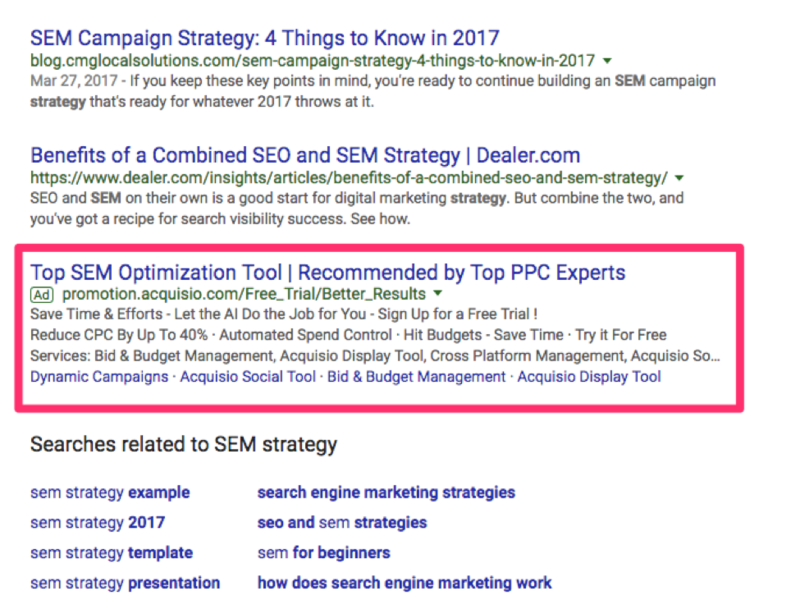 If you’re not entirely sure that a traditional PPC search campaign will work for your audience, you have other SEM options to try that might better fit your goals. With a growing share of the mobile market engaging in search, SEM provides a perfect opportunity for sites to capitalize on mobile marketing while still gaining traffic across multiple platforms. 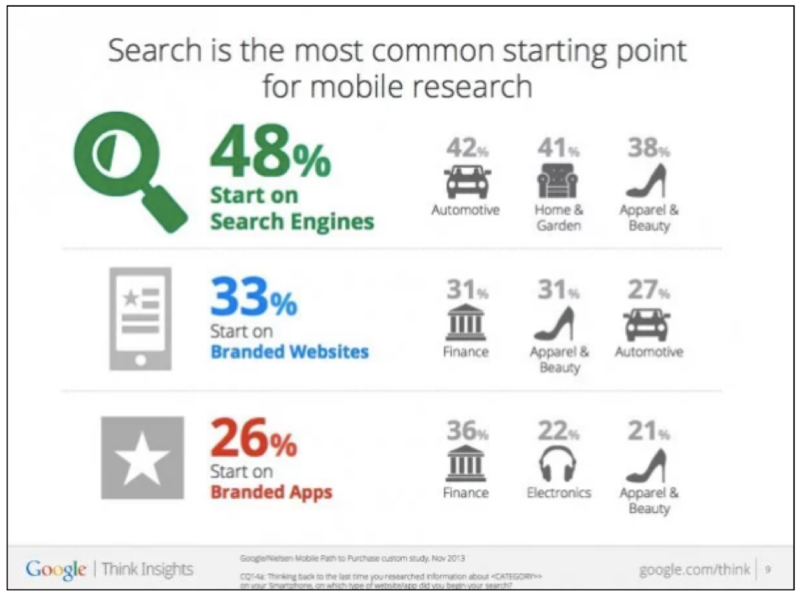 After all, most consumers turn to search engines when they’re researching with mobile devices. The greatest benefit of SEM is that it gives your campaigns flexibility like no other channel (outside of display). Ads can be customized by audience, type, and even location. Ad budgets can be as small or as large as needed to maximize results. Even the search engine that ads are displayed on can be customized in different ways to create the perfect marketing cross-publisher campaign. There’s no one-size-fits-all solution for brands and their customers, so it would stand to reason that there shouldn’t be a one-size-fits-all solution for marketing. SEM provides that flexibility with greater options for campaign targeting and subsequent success. So why use SEM? It works! These 15 powerful reasons should convince any client to at least give paid search advertising a try. As we said, SEM has the potential to offer instant results, conversions and more money, so client’s shouldn’t need to wait long before they become an SEM believer. Aside from that, SEM gets brands to the top of the SERPs, it can provide visual Google Shopping campaigns and call-based campaigns, and is great for local marketing and mobile users. It provides flexibility to advertisers and can even help inform other marketing channels! What is not to love about SEM? It’s important for brands to focus on SEM so that they can see both immediate and long-term results, analyze that data for better insights, and, in turn, convert visitors into customers. SEM has the power to do all that, and more. What is the Difference Between Google Express and Google Shopping?